The Rabun County TARS of Georgia have a unique way of attracting new members and funding their bank account. They have a Button Factory that has produced thousands of buttons and has drawn attention at many GOP events. 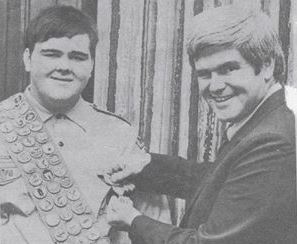 The button press seen in the picture was purchased from Badge-A-Minit back when Newt Gingrich helped the club’s Advisor, Ed Henderson, establish the first TAR Chapter in Georgia in the 1970s. With some WD-40, Ed pulled the rusty old button press out of mothballs as the Rabun County TARS recruited teens from small rural mountain towns and villages far from Atlanta. They took the buttons on the road to MILO events and cranked out Deplorable Buttons within 24 hours of Hillary’s comments. They also delivered buttons to county GOP parties across the Blue Ridge and Great Smokey Mountains of Georgia and the Carolinas. The Button Factory was on display at their senior party headquarters as they had a fully operational voting booth up with a touch screen voting machine. Over the course of several months, countless school age children got to help make buttons and learn about the voting process. The Rabun County TARS have found additional great achievements in the past year. Last May, the Club Chairman was elected at the Senior Party State Convention by over 3000 delegates to be a member of the Georgia delegation to the Republican National Convention in Cleveland. The Vice Chairman has served as a page at the Georgia General Assembly. The profits from the button factory—about $1,300—did far more than fill their coffers and fund their organization; it attracted real attention and helped recruit even more youth. They were even able to help start a second chapter at a local school! Now that the Georgia General Assembly has gaveled into session, the Rabun County TARS are taking car loads of members down to serve as paid pages for the day for their newly elected State Representative, Matt Gurtler. At age 27 he is the youngest member of the Georgia General Assembly and yet another testament to the power and energy of getting young people involved in politics. The club is not done with the button machine, either. The 9th Congressional District, the reddest district East of the Mississippi and home to newly installed House Republican Conference Vice Chairman Doug Collins, is coming right to Rabun County for the District Convention. The TARS will be aiding in registration and cranking out more buttons! Written by Ed Henderson, Advisor for the Rabun County TARS of Georiga. In addition to forming the first TAR Club in Georgia, Ed served as the first State TAR Chairman of Georgia in 1979. Request our new Fundraising Manual! Wow! What a great way to fundraise. I’m the president of the River Parishes TARS in Louisiana and we’re interested in making buttons for our local officials. We’d love any advice or help you guys could offer. Good luck guys!